Tomorrow I’m publishing a new report which reveals the extent to which former council homes sold through the Right to Buy are now being rented out by private landlords. In advance of its publication I wanted to share some of the individual borough findings with Labour councillors in London today. Across London, 42% of homes sold off through the Right to Buy are now being rented out by private landlords at market rates – up from 36% when I last investigated this issue in 2014. In Newham, 44.6% of former council homes sold through the Right to Buy are now being rented out by private landlords. There are at least 5 individuals in Newham who own five or more former council homes. My report also reveals that councils in London are spending a total of at least £22 million a year renting back 2,333 of their former council homes to house homeless families. These were homes they were forced to sell at a discount that they now have to pay market rates to rent back. Newham has to rent back 808 homes at an annual cost of £12,858,869. 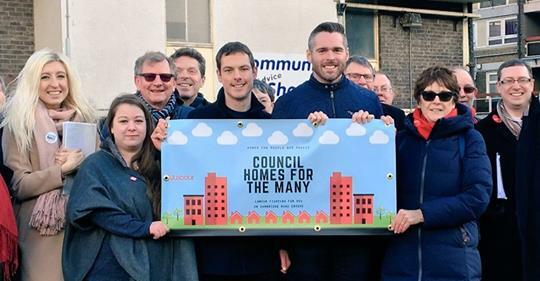 It would be galling if the crucial work Labour councils across London are doing building new council homes for the first time in a generation was undermined by the continuation of the Right to Buy. That’s why I’m asking people to take action by signing this petition calling on Theresa May to end Right to Buy in England. The Scottish and Welsh governments have already done so. I would be extremely grateful if you could promote this petition on social media so that it can attract as much support as possible. The full report will be published on my website tomorrow along with the data tables. If you have any questions about the research, or would like to discuss it, please let me know". I agree entirely that right to buy should be scrapped. I also think that the Labour Party in particular needs to explain why it has supported and promoted councillors who have exploited the scheme and built large property portfolios. The scheme has been used and abused by so many but when councillors do so it is unforgivable. Many will say that we should leave the past in the past but what has happened in Newham and other London boroughs is a disgrace. I understand that the money gained from the sales could not be channelled into new builds but there have been a small handful of Labour councillors quick to exploit the scheme with seemingly no criticism from their colleagues. It has saddened me that those who bring the Labour Party into disrepute by their greed and avarice went unsanctioned and often selected to serve again. I think that we need to be careful about this. I had push back from a very respected working class Custom House Labour Party member whose parents had bought their Council House but still live there as their home. Also, I don't have a problem with landlords who are decent and treat their tenants with respect. It is the criminals who I want to jail. I also remember having a conversation with a landlord who told me that due to overt racism the only job he could get in this country was buying property and renting it out. John, I understand and agree with what you say but it does not alter the simple fact that many have exploited the right to buy scheme and have become very bad landlords on the back of it. That has included some Labour Party luminaries in the London Boroughs and the Labour Party has seemingly done nothing about their conduct in the past. As you know that has included a very small number in Newham and it was heartbreaking to witness conduct that we would have quickly and rightly condemned a Tory councillor for.